Whenever we get a shout out from a national or regional publication I love to give you guys a peek. 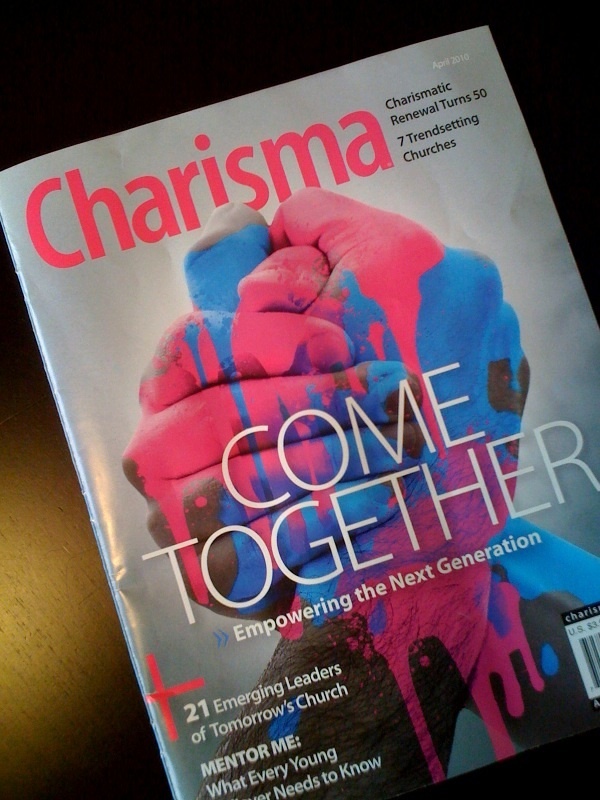 Well this month we got a cool little feature in Charisma magazine as being a “Trendsetting Church” (April 2010). So hats off to all you wonderful leaders at Substance… after all, you guys are the ones who truly deserve all the credit! Especially after these last few weeks… launching our new video venue… we’ve had some of the most amazing conversion stories come in. And YOU guys are the reason! I was just reflecting on the fact that we’ve gotten over 500 new people into weekly ministries in the last 6 months alone. And, I don’t know about you but… dude, that’s a lot of people! And with all the new small groups we’ve been launching it really shows that this is a church that’s about the people… not about me… or any other personality. My pastor friends have always been amazed by the extremely high level of volunteerism that pervades our movement. And that really speaks highly of all of our mid-level leaders who keep stepping it up every Sunday. Long story short: I LOVE you guys! I really do. I’ve actually been in the middle of a 8 week tour of conference speaking engagements (Even though I’ve still been here on Sundays). Honestly, it’s been a crazy season for me. But even though I’ve been meeting wonderful Christians all over the U.S., there’s no place like home. You guys are the best. And when magazines like Charisma keep investigating all of you, it’ll be hard to keep a lid on things! So keep rocking it Substance! God is turning you into a group of Spirit-filled trend-setting hardcores for Christ! And P.S… if you check out the article, make sure you check out Healing Place Church (featured on the next page of the magazine)… After all, Dino Rizzo is one of our overseeing pastors and mentors. In many ways, it’s an honor to be placed anywhere near such an amazing church. We just had a crazy worship night last night. Wow. I feel beat up, yet happy! (I can see why God is gonna give us resurrection bodies to worship him in heaven). The crazy thing is that we had over 400 people join us live online (isn’t that crazy?) But, right before I got to hang with a stinkin cool pastor named Scott Wilson from a great church called the Oaks. Obviously, many of you know that I’m a real nerd when it comes to the science of church health. I’m constantly writing essays and books on church governance and church systems (In fact, check out my backstage pass if you’ve never seen them… http://www.substancechurch.com/backstage-pass/) But last night I met another method nerd in Scott Wilson. His church has been rockin it for some time. (Of course it helps when you have Shane and Shane along with Bethany Dillon to lead worship). 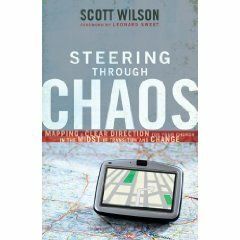 But, as I’m reading his book, Steering Through Chaos, Scott is no slouch. In fact, leaders, if you’re looking for a great book on vision, this is the deal! Which, speaking of vision, get ready because I’m going to be sharing a critical church update during our Deeper teaching night on Tuesday March 9th! Of course we’ll record it and live stream it; but, as many of you know: We’re adding a 5th service to accommodate our crowds! We’ve been at capacity at our Northwestern campus for several months. But we’re finally ready to add another service. But, this is only one of the exciting changes. We have some inspiring plans for our small groups and discipleship processes. So make sure your ears are open this coming month! In the meantime, I love you guys! Keep serving and seeking the Lord with all your hearts! I cry when I watch NFL films. I know it’s a strange confession… especially for an artsy alternative boy like myself. Both in high-school and college I was the “extreme-sports-only” guy. But, NFL films make everything so climactic. And, let’s be honest, NFL films aren’t necessarily about football. They’re about normal people with huge aspirations. Any discerning viewer knows that these films are about under-dogs, about overcoming pain, and about defying the odds. And they’re not merely about “players” but about highly scrutinized leaders who choose to do battle every Sunday. (Can you see why I relate to them?) Come Monday morning, there are no two professions on earth that are more similar. Pastors and players alike feel the joy and pain, the botched plays and big gains, the triumphant headlines and scathing pushback. Of course, if you haven’t already made fun of me for crying over NFL films, then you probably agree. And, perhaps it’s just because I’m exhausted from preaching right now. Our church has been growing so fast. And lately, I’ve been making so many tough decisions for the church that are bound to get people both inspired and mad. To add to my pressure, I regularly get indirect feedback from local pastors who love or loathe us. And, to boot, I recently shared a really vulnerable sermon. I mean, Mondays are filled with insecurity, adrenaline, and hesitant feelings of victory… a lifestyle that’s tiring; but, man… this is also addictive. I may not be winning highly publicized games; but, Substance is filling up with totally unchurched people. And, after watching dozens of cynical 20-somethings give their lives to Christ last weekend, my heart is full. Recently, I was watching a well-known quarterback do a press-conference after a big win one Sunday. But despite the great win, it seemed like everyone had scathing opinions about the quarterback’s lightning fast decisions. And people were trying to render the win as meaningless just because they were angry that the coach and quarterback didn’t win the game the way they wanted. I was amazed over how many “non-players” sat around spewing idealisms about what another person should do. And suddenly, in that moment, the Lord spoke to me about churches in general. Unfortunately, immature spiritual leaders rant about how other people should use their resources and authority. I recently heard an itinerant minister and professor spew idealisms about church methodology; yet, neither of them had the guts to actually become a pastor (forcing them to deal with their own limitations and false assumptions). Over the years, I’ve found that these types of people are a dime a dozen. Many of them are probably well intentioned people inside of your church; but, good players and quarterbacks focus on their own game. Perhaps that’s why God gave real players the first string position in the first place and why others don’t have the same authority (Rom 13:1). For example, some Christians think they need to rant and worry about the Joel Osteens, Mark Driscolls and Bill Hybels of the world. I, too, have many hesitancies; but unfortunately, by this very focus, we reveal that we are nothing more than pathetic sideline commentators. And quite often, we critique, not because we care about these leaders as much as it’s easier to focus on other people’s faults than work on bearing more fruit ourselves. You see, a real player would silence their competition by winning more. And even once they’ve earned the authority to critique their foes, they instead use their insight to coach them. Do you notice a difference in approaches? Besides, the Bible says there’s only one true commentator and coach (a.k.a., judge), Jesus Christ. So wherever you’re at: Join a team and follow a leader that actually plays the game…a leader that’s so overwhelmed by the greater mission that they don’t have time to bicker about other leaders…especially from their pulpits. Because here’s my spin: Right now the devil is winning the battle for the U.S. With less than 1% of people under 34yrs old attending any church of any kind, the U.S. church, as we know it, has failed our generation. And when only 9.1% of all Americans go to any Evangelical church with consistency, it drives me crazy when Christians spend most of their time blustering about other Christians. It’s like we’re on a sinking ship debating about its color when we should be busy plugging the hundreds of holes. And, I’m certain this drives the Lord crazy as well. And that’s where football comes back into the picture. The best players are those who know how to focus on their own games and pound the hell out of the football. Heaven will replay it’s own type of “films” of the ultimate heroes. And they will be people who actually fulfilled God’s call on their lives rather than the imposed callings of the cynical spectators around them. Certainly, be open to the advice of true coaches. But we’ve got to be careful to discern the difference between critics and coaches… godly pastors vs. cynical idealists. Every pastor will lead as uniquely as the gifts God has placed inside of them. So, don’t let any commentator take your bloody knuckles off the turf just because you didn’t win the game the way they wanted. So Leaders: Let the cynics rant. But, you, Be a champion. Wow, I just got to do one of the coolest things yesterday. In case you didn’t know, we belong to one of the most amazing church organizations called the Association of Related Churches. (ARC). Yesterday was a national “C.P.R.” Church Planters Roundtable where people fly in from all across the country to learn about the ARC and other essential church planting mentalities. But, I actually got to teach some of it. And I’ll tell you what: Substance, we’re gonna be doing a lot of this. There is such a need for new churches. And there are not enough people putting enough time into mentoring a new wave of planters. But I’m telling you what: We’re gonna do it. So get ready: God is gonna use us to launch 100’s of churches in the next couple years. What a weekend!I hope you guys enjoyed John Bolin!Talk about a fun guy.It was also a huge blessing to me as I was preaching at NorthCentral University’s Missional Conference. I would be exhausted today if I had to preach 3 services, a leadership service, and then 3 more sessions here at the NCU conference. Today I got to do three different sessions to a room full of pastors and ministry majors.And man, it’s fun to brag about all of you delightful men and women of Substance.There’s no church like you! I also got to speak to the entire student body.And right before I went up the M.C. asked, “How many of you have been to Substance?”And i’m telling you… half the student body raised their hands.I was shocked and blown away by how many people God has enabled us to influence.My wife, Pastor Nick and I all had to pick our jaws off the floor.I mean, we’re just a brand new church!It feels so humbling that, in a few short years, we get to do this kind of stuff.I mean, who am I to be able to speak to all of these young people? As I walked away, I felt like God was speaking to my heart about the future of Substance.God is giving us influence.And this is a precious gift of God. I guess, if I could put it another way,I just felt a strong challenge in my heart to “live a life worthy of the calling I received” (Eph 4:1). And I hope that you receive the same challenge. So, thank you God!Thank you for letting Substance impact the lives of others!